(Rick Egan | The Salt Lake Tribune) Vivian Lee speaks at a news conference celebrating the University of Utah Hospital on Friday, July 10, 2015. Vivian Lee has quietly left her teaching position at the University of Utah — about one year after resigning as CEO of its health system and dean of its medical school following her controversial decision to fire the leader of the Huntsman Cancer Institute. Lee stepped down as a tenured professor of radiology at the end of April, at the same time her contract ended for one final year at a $1 million salary. Neither she nor the university announced the move at the time. The health care expert has since accepted a position at Verily, a life sciences research group owned by the same company that oversees Google, according to the biography on Lee’s personal website. She is listed on the organization’s page as the president of health platforms with a focus on patient populations. She could not be reached for comment Monday. Kathy Wilets, health care spokeswoman for the U., said Lee is considered to be on unpaid leave until May 1, 2019 — because of a contract she has with the school — and will remain on staff as an adjunct professor in radiology and biomedical engineering. In her voluntary staff role, Lee will not receive any pay or benefits. But she would be allowed to collaborate with other faculty for research, if she wanted. She also does not have a continuing role on any boards or advisory groups, Wilets added. She is not currently teaching any classes, and there are no agreements for her to teach in coming semesters. If she wanted to return before her contract ends in 2019, it would be up to the individual department head. If she doesn’t, she’ll be removed from the university’s system. Lee set off a weekslong firestorm in April 2017 — which ended in her resigning from various leadership positions — by abruptly firing Huntsman Cancer Institute Director Mary Beckerle without explanation. Beckerle was quickly reinstated by then-U. President David Pershing, who shortly afterward announced his own retirement. He, along with Lee, was responsible for firing Beckerle. Pershing promised to change the reporting structure so that Beckerle would report directly to the university president instead of to the person who would fill Lee’s position. The university appointed that replacement this summer: Michael L. Good, formerly the dean of the University of Florida College of Medicine. 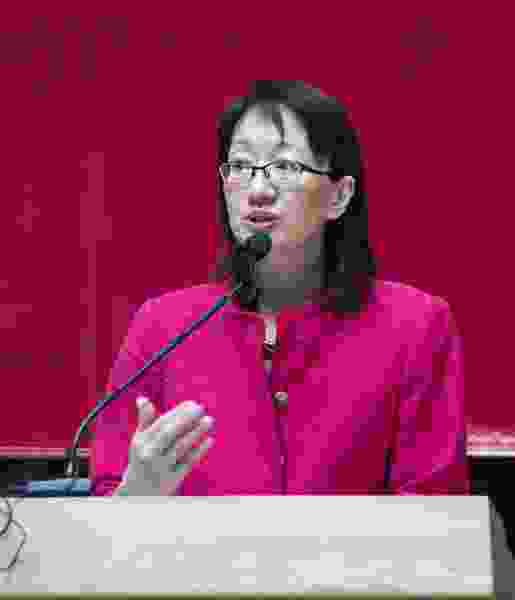 Throughout the dispute, university officials defended Lee’s six-year tenure as a top administrator, saying she substantially improved its sprawling, multibillion-dollar health operations. Since arriving in 2011, she increased the number of medical providers by 400, bumped the U.’s quality ranking from No. 7 to No. 1 in the nation and boosted its grant monies from $100 million to $288 million. Lee came to Utah from New York University, where she was vice dean and chief scientific officer for NYU's medical center. At the U., she led a push to integrate the colleges and departments in health sciences, reduce the cost of care and improve quality. In an email last year announcing her resignation as CEO of University of Utah Health Care, dean of the U. School of Medicine and senior vice president for health sciences, Lee wrote that she's "worked as hard as [she] could to carry forward the mission of our entire health sciences community and of the university." Verily, the company that Lee is now working for, is trying to move from research and development into creating products and possibly running clinics. It has expanded its staff this year to also include a former USDA commissioner and a pharmaceutical CEO. Though the U. does not currently have any partnerships with the organization, Wilets said Verily may be a sponsor for an upcoming summit that’s still being planned. Editor’s note: Paul Huntsman, a son of the late Jon Huntsman Sr., is the owner and publisher of The Salt Lake Tribune.